Tucked within an annex of the Alexandria Hotel, The Wolves may be Los Angeles’ most interesting cocktail bar. Not only is it a meticulously designed and gorgeous space, but it also offers one of the most distinctive bar menus in town. There’s no paying $14 for a standard mule here. The Wolves draws from nature itself for an ever-changing menu with a whole host of ingredients made in-house. When it opened in 1906 the Alexandria Hotel was the city’s most luxurious lodging option. As with many of DTLA’s early 1900s hotels, The Alexandria ultimately fell into disrepair following the Depression, but not before drawing guests like Theodore Roosevelt, Mary Pickford, and King Edward VIII in the decades that preceded. In 1911, the hotel received an add-on that included the Palm Court banquet hall. It’s within this addition that The Wolves—a stunning anachronism, designed with the Alexandria’s turn-of-the-century grandeur in mind—can be found. 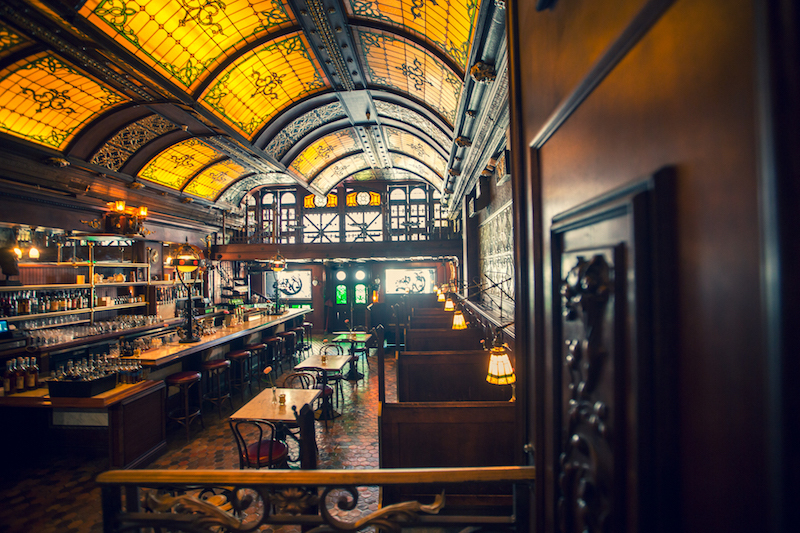 Most striking is a domed stained glass ceiling sourced from an Illinois train station that’s been split down the middle and fit perfectly over the bar and dining room. 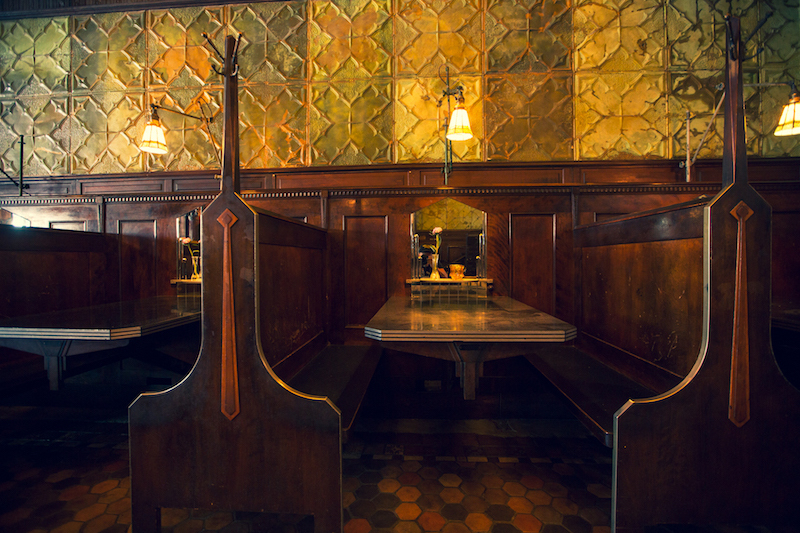 The booths are antique mahogany, while the bar counter is antique white marble. A second floor mezzanine and balcony, accessible via a spiral staircase, is lined with salvaged gating. Various vintage oddities are everywhere you look, including a human skull in a curio cabinet near the restrooms and old Los Angeles street lamps positioned here and there. 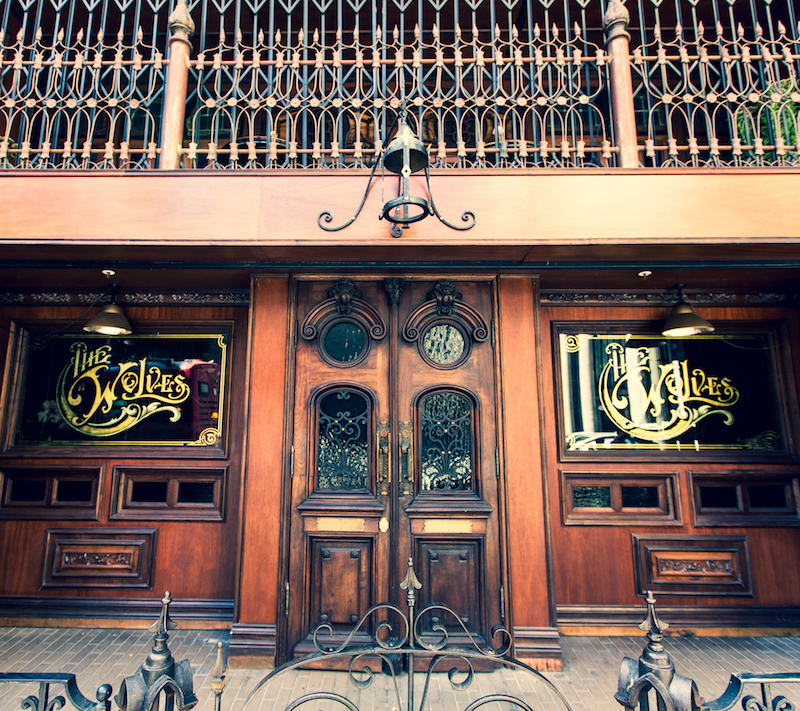 Fireplace andirons, carved like owls with glowing eyes, flank the beer taps, the handles of which are old, wooden billy clubs. Green tiles from the bathroom ceilings have been relocated to line the dining room walls below original 1911 brown wallpaper. Look up and you’ll find three faces that line the ceiling in a repeating pattern. These are an original design feature. Rumor has it these faces are from Dante’s Inferno, but thus far, no one has been able to identify them with certainty. Look down, and you’ll see authentic brown and tan tiles from Pasadena tile-maker Ernest A. Batchelder. Impressively, they were already there when the The Wolves team—including owners Al Almeida (The Falls) and Daniel Salin, and managing partner Isaac Mejia—moved in. This is the same artist responsible for the tiles that line the nearby, though long-closed, Dutch Chocolate Shop. Bar Director Kevin Lee, who previously opened La Mirada’s now-shuttered Puzzle Bar, fell in love with The Wolves the first time he saw it. He makes the bar’s many liqueurs, amari, bitters, and vermouths in-house, their flavors highly dependent on seasonality. Lee got into making his own ingredients when trying to make the best possible Old Fashioned. He experimented with a variety of sugars, ultimately settling on Muscovado, an earthy, unrefined sugar. Next, he experimented with his own aromatic bitters. He chose Booker as his base, combining it with some 40 ingredients and aging it for two months. Many of Lee’s concoctions are suitable for drinking alone. For instance, he makes an easy sipping biscotti liqueur inspired by a trip to a small restaurant in the southern Italian countryside where he met a woman who made her own biscotti, which could be dipped into her house-made amaro. Lee said he decided to make the biscotti amaro in honor of that memory. You don’t expect that it’ll taste like drinking a boozy cookie, but it does. Lee also notes that, despite his travels in Italy, it’s been hard for him to find modern bars where the amaro and vermouth is house-made. He compares it to the things his Korean grandmother would make when he was a child. Guests to The Wolves will be offered a vermouth that serves as an aperitif at the onset of their visit. The vermouth in question depends on what’s in season and what’s in stock, and may change as frequently as every three days. The “Mostly Carrot” derives its name from the house-made carrot liqueur that’s mixed with gin, lavender rose vermouth, juniper cordial, lemon, soda water, yuzu bitters, and pine fragrance. It’s an earthy, lightly sweet cocktail. The “Fall Apples with Amaro” is a fresh, brandy-based autumnal cocktail with a hint of salt and finished with a spritz of nutmeg spray. The “Banana Cream with Some Herbs” is in a flavor realm of its own, made with bourbon, fermented bananas, lavender rose vermouth, dill and caraway liqueur, grapefruit, and an orange crème fraîche that makes the whole thing taste like a creamy dessert in a glass. Fans of boozier drinks may enjoy the “Bourbon Cranberry with Smoke,” where the cocktail is infused with port barrel smoke in a large decanter prior to being poured over ice. Lee chose to serve the cocktail this way based on service he received in Japan, where he noted that the sake in the glass was cooler and crisper than the warmer, woodier sake in the box. Guests may try to note the subtle differences in this particular cocktail similarly, sipping alternately from the cup and the wooden vessel. Opening December 1 will be The Wolves’ second floor bar, Le Nèant. 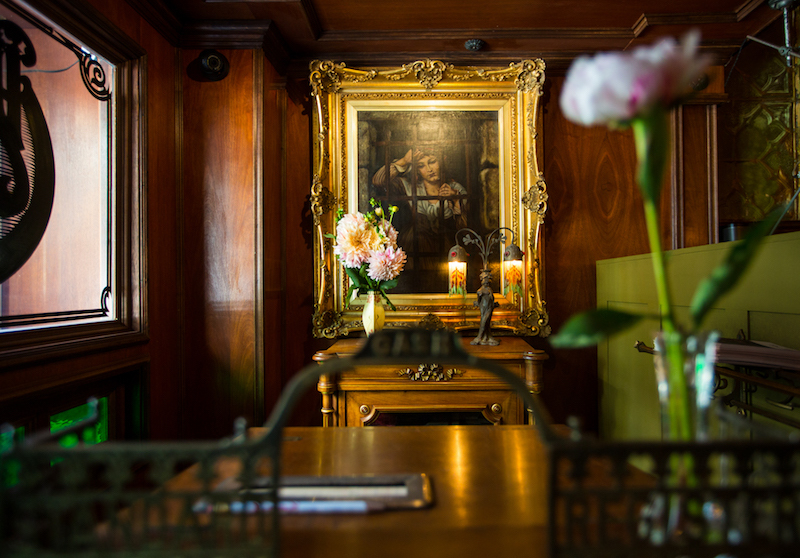 The intimate lounge area features an ornate backbar Almeida explains came from a bar his father once owned, while the opposite wall features a large of a crowd at a Teddy Roosevelt speech in Brooklyn, inspired by the former president’s time at the Alexandria. Le Nèant’s stage will host vaudeville performances, while the cocktail experience will be omakase-inspired. Guests will be offered a list of five to 10 ingredients sourced from the farmers’ market to choose from, and that list will change every week or two. For those who need some food with their cocktails, Chef Matt Poley (Heirloom LA) offers a menu of shareable dishes, including charcuterie, a tomato and burrata flatbread, a veggie burger, and cashew cheesecake. A small selection of beer and wine is also available. The Wolves is located at 519 S. Spring Street in downtown Los Angeles, (213) 264-7952. Open Tues.-Sun., 5 p.m. to 1 a.m.